Glorious colour from midwinter through to late spring. The latest and best Polyanthus around; prolific in flowering displays & fully winter hardy. Flowering non-stop from midwinter through to late May every year. The foliage is lusciously deep-green, allowing bright fragrant blooms to stand out brilliantly! Easy to grow, they work best in sunny or lightly shaded spots in tubs, baskets and planters. Supplied as 20 garden ready nursery-fresh plants, a perfect size to plant straight out in autumn. The latest and best Polyanthus around; a 'multiflora' variety and therefore incredibly prolific in flowering displays, fully winter hardy and will flower non-stop from midwinter through to late May every year. The foliage is lusciously deep-green, allowing the bright fragrant blooms to stand out brilliantly on their strong stems and for you to even take some cut posies of flower if you want to! Easy to grow, they work best in sunny or lightly shaded spots in tubs, baskets and planters, or the front of garden borders. Supplied as 20 garden-ready plants, to be planted straight up into their flowering positions. Supplied as 20 Garden Ready plants ready for you to plant up into their final flowering positions. Flowering time December to May. 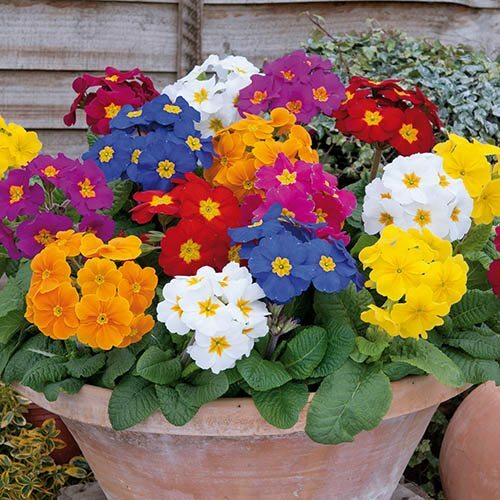 It is best to acclimatise your polyanthus plants to outside conditions over 7 to 10 days, before planting out in their final positions. Choose a position in full sun or semi shade on any fertile, moist, well drained soil. Keep well watered (but not waterlogged) until established - during the winter, avoid over-watering and don't allow water to sit in the crown as this may cause the plants to rot in cold conditions. Deadhead spent blooms to encourage more flowers. Established or overcrowded clumps of polyanthus can be divided in late autumn and early spring.